Not to be confused with King County, Washington. King County is a county located in the U.S. state of Texas. As of the 2010 census, its population was 286, making it the second-least populous county in Texas and the third-least populous of any county in the United States. King County has no incorporated communities. Its county seat is the Census Designated Place of Guthrie. The county was created in 1876 and organized in 1891. It is named for William Philip King, who died at the Battle of the Alamo. Republican Drew Springer, Jr., a businessman from Muenster in Cooke County, has since January 2013 represented King County in the Texas House of Representatives. Apache and Comanche were early tribes in the area. The Red River War of 1874-1875 was a United States Army campaign to force the removal of Natives in Texas and their relocation to reservations, to open the region to white settlers. On August 21, 1876, the Texas legislature formed King County from Bexar County. By 1880 the United States Census counted forty residents in the county. In 1891, the county was organized. Guthrie was designated as the county seat. Early ranchers preserved water by damming canyons and draws to hold the heavy spring rains. In the 1890s windmills became the method of water preservation. Some of the earliest settlers were Isom Lynn, A. C. Tackett, Brants Baker, and Bud Arnett. The Four Sixes Ranch. was established in 1902 by Samuel Burk Burnet. The formerly-named Pitchfork Land and Cattle Company was organized in 1883, and SMS ranches were established during the same time frame. The 6666 (called Four Sixes Ranch), also founded in 1883, was managed from 1965–1986 by George Humphreys, who was also affiliated with the National Ranching Heritage Center in Lubbock. Dumont was formed in the late 19th century. By that time, farmers began to share the land with ranchers. Cotton was the leading crop for a time, followed by corn, sorghum, and fruit trees. Oil was discovered in the county in 1943. By January 1, 1991, almost 114,403,000 barrels (18,188,600 m3) of oil had been pumped from King County lands since the first wells were drilled. According to the U.S. Census Bureau, the county has a total area of 913 square miles (2,360 km2), of which 911 square miles (2,360 km2) is land and 2.5 square miles (6.5 km2) (0.3%) is water. As of the census of 2000, there were 356 people, 108 households, and 88 families residing in the county. The population density was 0.39 people per square mile (0.15/km²). There were 174 housing units at an average density of 0.19 per square mile (0.07/km²). The racial makeup of the county was 94.10% White, 1.12% Native American, 3.09% from other races, and 1.69% from two or more races. 9.55% of the population were Hispanic or Latino of any race. There were 108 households out of which 41.70% had children under the age of 18 living with them, 79.60% were married couples living together, 1.90% had a female householder with no husband present, and 17.60% were non-families. 16.70% of all households were made up of individuals and 1.90% had someone living alone who was 65 years of age or older. The average household size was 2.77 and the average family size was 3.12. In the county, the population was spread out with 33.70% under the age of 18, 3.70% from 18 to 24, 29.50% from 25 to 44, 22.80% from 45 to 64, and 10.40% who were 65 years of age or older. The median age was 37 years. For every 100 females there were 95.60 males. For every 100 females age 18 and over, there were 100.00 males. The median income for a household in the county was $35,625, and the median income for a family was $36,875. Males had a median income of $21,389 versus $30,179 for females. The per capita income for the county was $12,321. 20.70% of the population and 17.90% of families were below the poverty line. Out of the total people living in poverty, 23.00% are under the age of 18 and 31.60% are 65 or older. King County was once a strongly Democratic county even by Solid South standards. In 1948, 95.85 percent of voters supported Harry S. Truman, in 1960 76.9 percent of voters chose John F. Kennedy and in 1964, 84.1 percent of voters supported Lyndon Johnson. The county also voted for Hubert Humphrey by a plurality in 1968, with 48.7 percent supporting Humphrey while 31.7 percent voted for George Wallace and a mere 19.6 percent voted for Richard Nixon. However, the county has shifted strongly Republican since the 1980s. The last Democratic presidential candidate to win over twenty percent of the vote in King County was Bill Clinton in 1996. In the 2004 presidential election, 87.8 percent (137 votes) supported incumbent U.S. President George W. Bush, a Republican, whereas only 11.5 percent (18 votes) backed the Democratic challenger, U.S. Senator John Kerry. In the 2008 presidential election, 93.2 percent (151 votes) supported the Republican, Senator John McCain, whereas only 4.9 percent (8 votes) backed the Democrat, Senator Barack Obama. Of all United States counties, King had the largest percentage of support for McCain. In the 2012 presidential election, President Obama fared even worse in King County. His Republican challenger, Mitt Romney, received 139 votes in the county (amounting to 95.9% of the county's total votes in the presidential election), while President Obama received only 5 votes — amounting to 3.4 percent of the total. That percentage was the smallest percentage that President Obama received in any county in the United States in 2012. In addition, in the 2012 Democratic Presidential primaries (in which President Obama faced no serious opposition nationwide), King County was one of two counties that voted for Bob Ely over President Obama. There were only 7 votes cast in the Democratic presidential primary election in King County that year. Ely won 4 of them, Obama won 1, and two other minor candidates won 1 each. In the 2016 presidential election, Secretary Hillary Clinton continued the downward trend. Her Republican challenger, Donald Trump, received 149 votes in the county (93.7% of the county's total votes), while Secretary Clinton received only 5 votes — amounting to 3.1 percent of the total. Libertarian Party candidate Gary Johnson also received 5 votes. In the 2012 U.S. Senate election, Republican candidate Ted Cruz received 117 votes (amounting to 95.9% of the county's total vote), while Democratic candidate Paul Sadler received 4 votes, or 3.3 percent of the total. In the 2014 U.S. Senate election, Republican incumbent Senator John Cornyn received 87 votes (amounting to 96.7% of the county's total vote), while Democratic candidate David Alameel received 1 vote, or 1.1 percent of the total. Libertarian Party candidate Rebecca Paddock received 2 votes, or 2.2 percent of the total. In the 2014 Texas gubernatorial election, Republican candidate Greg Abbott received 90 votes (amounting to 96.8% of the county's total vote), while Democratic candidate Wendy Davis received 1 vote, or 1.1 percent of the total. Libertarian Party candidate Kathie Glass received 2 votes, or 2.2 percent of the total. The primary industries are raising beef cattle (since the late 19th century), and oil production (since 1943). Corn and cotton are the leading planted farm crops. There are no incorporated areas in King County. ^ "U.S. Census Bureau QuickFacts: King County, Texas". ^ a b c Leffler, John (2010-06-15). "King County, Texas". Handbook of Texas Online. Texas State Historical Association. Retrieved 13 December 2010. ^ Chiles, Jim (June 1980). "Who Owns Texas". Texas Monthly: 124. ^ Clayton, Lawrence; Salvant, J U (1997). Historic Ranches of Texas. University of Texas Press. pp. 55–60. ISBN 978-0-292-71189-1. 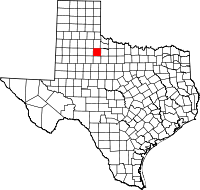 ^ "Dumont, Texas". Texas Escapes. Texas Escapes - Blueprints For Travel, LLC. Retrieved 13 December 2010. ^ "David Leip's Presidential Election Atlas - 1948 statistics". Uselectionatlas.org. Retrieved 2012-11-26. ^ "Dave Leip's Atlas of U.S. Presidential Elections - Data Graphs". Retrieved 28 November 2014. ^ 2012 Texas Presidential Election Results, from Politico. Retrieved on November 15, 2012. ^ a b CNN, Video: Visit the most anti-Obama county in the U.S., from YouTube. Retrieved December 4, 2012. ^ King County Race Summary for the 2012 Democratic presidential primary election, from the Historical Election Results Archived 2014-01-09 at the Wayback Machine section of the website of the Texas Secretary of State. Retrieved on September 18, 2013. ^ Texas results in the 2016 presidential election, from Politico. Retrieved November 22, 2016.